Villa Sapna’s situation is just spectacular, and we can think of no other villa that offers such all-encompassing views of both sunrises and sunsets over the sea. Wow! We also really loved the guest bedroom over the living room, the best spot to escape for a quiet read and rest. With its three walls of glass, vaulted ceiling and its orientation that extends towards the pool, we felt as though we were floating in the sky. The bedrooms offer plenty of space but all the beds are doubles, and we would have preferred larger king-sized beds and perhaps some twin beds for the kids. Like most villas in Phuket, the pool lacks a safety fence, so young children will need to be watched closely. What a wonderful holiday! 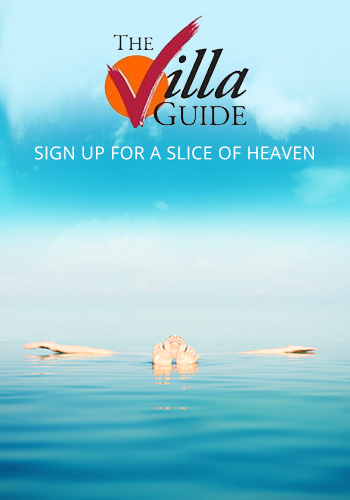 Amazing villa and the most gracious, available, kind, professional team at our villa. Everyday was welcomed with a smile. Every requests satisfied by the entire team. Thanks for making our holidays special! Thank you for taking good care of us. We enjoyed our stayed alot. The food was very yummy. This was our second trip at this villa and it didn't disappoint. A beautiful villa, friendly and attentive staff and some of the best food we've had in Thailand. We will be back. Thank you for a wonderful stay. The house is amazing and the service was fantastic. Would love to come back and visit again. Thank you so much for your warmth and hospitality. The food, your kindness was incredible and made our holiday even more worthwhile. Thank you is not enough. Hope to see you soon! This is a wonderful villa and wonderful service. The staff are very nice and helpful. Will come again. This is our third visit to the villa, which will give you some idea of how much we love it. The place is being very well looked-after and retain its charm, visit-after-visit. The staff have been very welcoming, looking after our every need. They go about their business in a quiet, unobtrusive manner, yet get so much done. Thanks to everyone and special thanks to Bhandaris. We hope to be back soon. Thank you very much for the wonderful care for our stay here at the villa for all three nights all food were awesome and one of the best I've ever had in Thailand. All the staff are friendly and nice. You've all given an unforgettable trip. Thank you all. Thank you so much for a wonderful stay in this special villa. We have loved swimming in the gorgeous pool and relaxing in the comfortable rooms. Most of all we have enjoyed the wonderful food and the immense kindness and thoughtfulness of Ning and her team. We would love to come back some day. We family members enjoyed our 2018 Chinese spring festival here and it's amazing. The villa itself looks perfect, even beyond our original expectation. The staff team are really wonderful. They prepare every meals delicious and lovely for us, and special meal for my 13 month old son. They even prepare special Chinese New Year dinner for us. We love them all. If we'll come back to Phuket again, this villa will definitely be our choice. Our family had a beautiful vacation and the villa provided every comfort that we needed during our stay. The kids loved the pool and yards, whilst adult read books and relaxed. We had one of the most amazing vacation so far, and already planing for next year. Staff led by Ai were amazing, best service and we could not get enough of the food. Each meal was delicious. Thank you for having us and I'm sure the villa will make good memories for many other families. based on 12 user reviews. 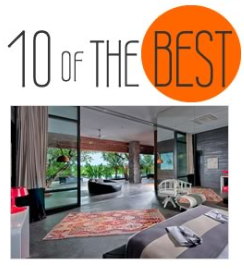 Villa Sapna really bowled us over with its amazing east-coast setting and sublime design. Every sense-pleasing thing we could dream of in a tropical holiday villa was to be found here: sunrise views, sunset views, sea views … yes! 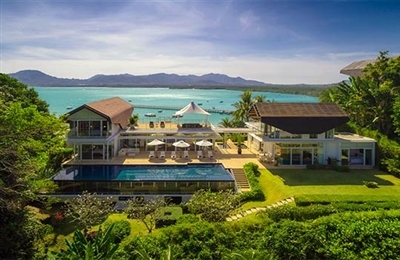 Add to that captivating paintings by celebrated Asian artists, modern architecture with a touch of Thai elegance, vibrant living areas that fully open to lush gardens, a 20-metre swimming pool, and attentive staff. And a gym. And a private chef who creates heavenly Thai tastes. And for ease of access, a lift. It’s hard to describe how uplifting it feels to be here, the quality of the tropical light and the vivid skies and the total serenity – just book it and see for yourself!